Welcome to the TestDEN Web Partners home page. Are you the owner of a website with English lessons for ESL students? Then you have come to the right place to add valuable content and earn commissions from your site. Visit our FAQ section to learn how the program works. TestDEN Web Partners Earn More! 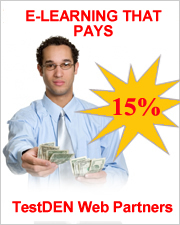 With online programs starting at $99, you earn 15% on every referral that leads to a sale. What are you waiting for? It takes just a few minutes to sign up! "TestDEN.com has excellent TOEFL test prep products and the 15% commission really helps to support my web site. TestDEN.com is a first-class operation!" Please fill in ALL form boxes unless indicated otherwise. Enter a Password that you would like to use to access your Web Partner Account Summary page. Please keep your Password in a secure place. It will not be replaced if lost or stolen. Click the following button to proceed to the TestDEN Web Partners Agreement. NOTE: The information you have entered into this form will appear as red text in the Web Partners Agreement. *TOEFL and TOEIC are registered trademarks of Educational Testing Service (ETS). This web site is not endorsed or approved by ETS.